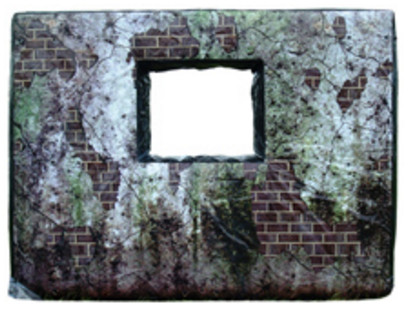 The Battlefield Infatable Window is basic gaming inflatable that when combined with other windows, doors and walls forms an “instant” maze. Windows are great for creating interesting mazes and depth in the battlefield. The window is basically a high wall with an added 1.2m wide window opening. The gaming inflatables are able to be used either indoors or outdoors. The Window has a 1.2m (3⅞ ft) wide window opening positioned centrally in the wall. Our gaming inflatables are built to the highest standard. Our ingenious 2-layer system means that the walls, windows & doors appear flat, unlike tradition inflatables which balloon. The inner layer is a heavy duty rubber inflatable, the internal structure uses the same concept as a bicycle tire, once it is inflated it will stay inflated.